The world economy has become more fragile. And it’s not just that the stimulus-driven recovery from the 2008 crisis has been anaemic and incomplete. Another worrying trend is the shift in the age structure of the global population which may have eroded some of the crucial shock absorbers. To see the connection between demographics and economic fragility, consider the ratio of middle-aged people – those aged between 45 and 54 years – to the young who are still in their twenties. For the world as a whole, this ratio has shot up from 0.48 in 1990 to 0.65 in 2010, and will climb to 0.85 in 2035, according to the United Nations’ population projections. In the developed world, the number of middle-aged overtook the number of young in 2005, and the ratio won’t start declining until after 2025. The relationship matters because the global economy’s ability to withstand deflationary shocks is lower when the middle-aged cohort starts dominating the young. That’s because the former saves more for retirement. In the United States, the median householder in the 45-to-54-year age group has 6 times more assets excluding home equity than someone younger than 35. But it is young peoples’ spending that spurs new investment, which in turn soaks up the savings of the middle-aged. When the ratio is rising, as it is today, a bigger group of the middle-aged are trying to deploy their savings. But because the younger group is smaller in relative terms, its consumption is inadequate to encourage investment. As a result, the savings chase a limited number of investment opportunities, pushing up prices. Even a minor shock can lead to severe market fallout. This phenomenon has many names: some call it a “savings glut,” others prefer “secular stagnation”. But the global population’s age structure has a message for policymakers: don’t underestimate the risks from turmoil in even minor emerging markets. With its shock absorbers frayed, the world economy will struggle to negotiate deflationary speed bumps. As the ratio of the middle-aged to the young is forecast to carry on rising for the next two decades, markets are in for a rocky ride. 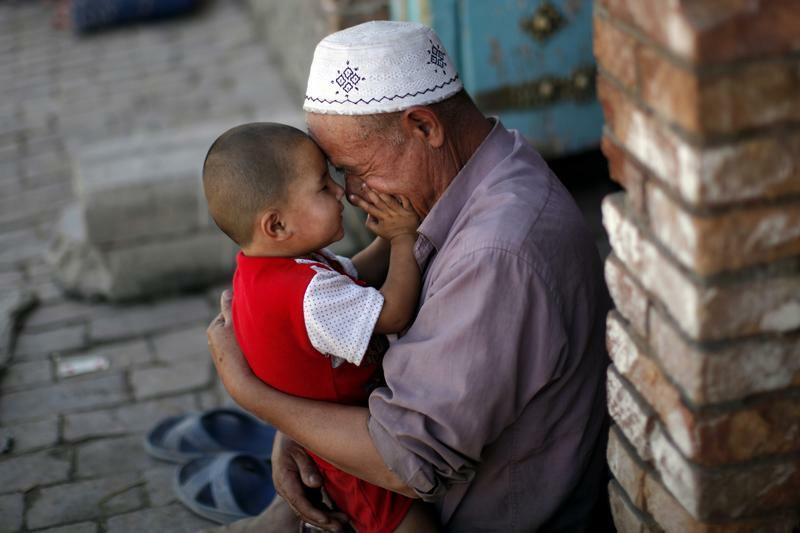 An ethnic Uighur man plays with his grandson in the old district of Kashgar city, in Xinjiang province August 4, 2011. “Demographics and the Behaviour of Interest Rates,” by Carlo Favero, Arie Gozluklu and Haoxi Yang, was published in September 2012.